Pet parents who have purchased the product with specific lot/date codes listed at http://www.hillspet.com.au/productlist should discontinue feeding and dispose of those products immediately or return unopened product to your retailer for a refund. 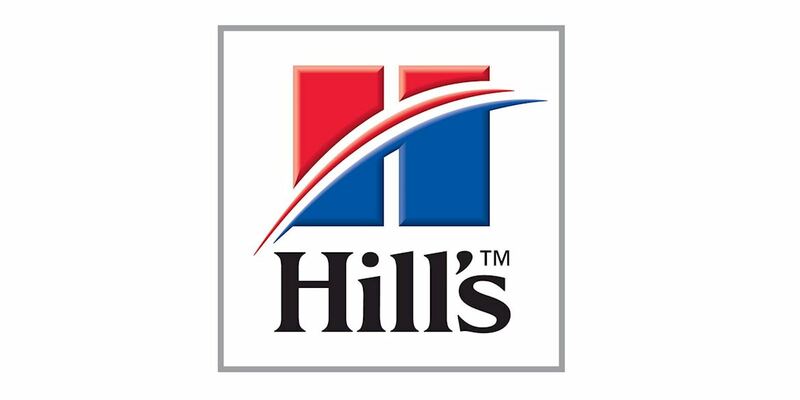 To have affected products of the specific lot/date codes replaced at no cost, please contact the place of purchase, or contact Hill's via our email hillshelplineANZ@hillspet.com, website or at 1800 679 932. No dry dog food, cat food or treats are affected. Stem Cell Therapy- Available Now! Stem cell therapies have been developed to treat a number of conditions in dogs, cats and horses including arthritis, degenerative joint disorders and tendon, ligament and cartilage injuries. Stem cell therapies have been shown to substantially improve quality of life by reducing inflammation and pain, leading to increased mobility. Treatment is given injection either intra-articular (in the joint) or intravenously (into the vein). Results provided by Magellan Stem Cells report reduced pain and increased mobility in 90% of cases, with results usually within 5 months of the stem cell therapy. Clients of ours report an overwhelmingly positive improvement in their pet’s quality of life. The cost of stem cell therapy is less than you may expect. The price varies depending on the therapy selected, the size of the patient and any pre-requisite tests required. If you would like to discuss your pet’s suitability for stem cell therapy, please get in touch to make an appointment with one of our vets. Alternatively, visit www.veterinarystemcells.com.au for more information. 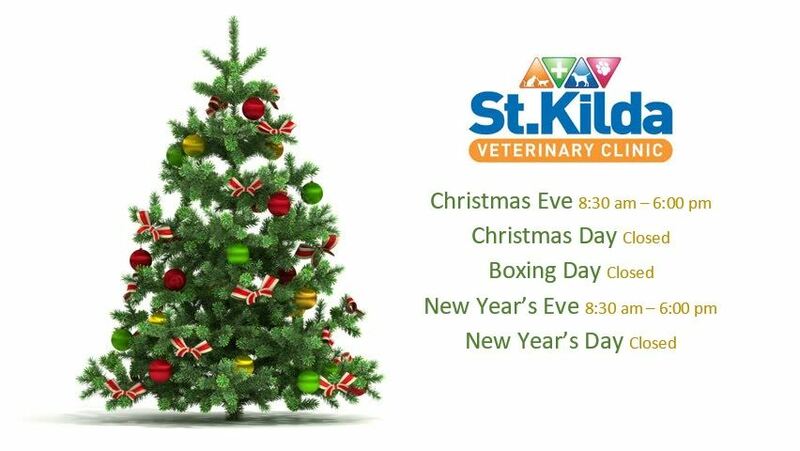 The St Kilda Veterinary team would like to thank all of our clients and customers for their support in 2018. Merry Christmas and Happy Holiday! We are now offering Openpay! 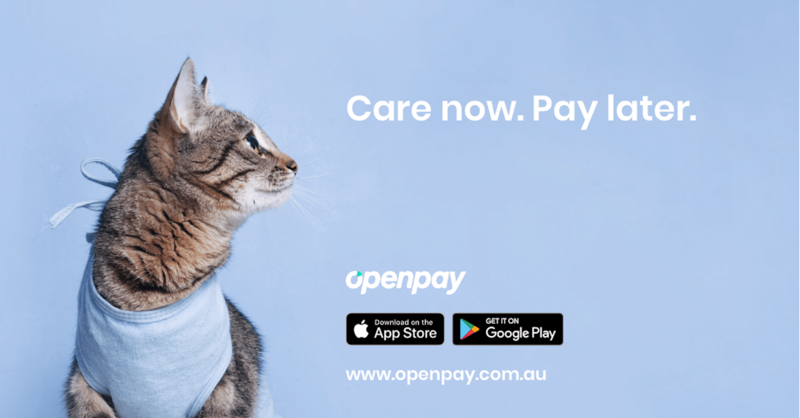 Openpay allows you to pay for your vet visits and expensive surgical procedures in manageable weekly or fortnightly installments WITHOUT INTEREST! You can select this payment method for bills of $100 up to $7000. Set up is quick and simple and is easily processed on the spot. 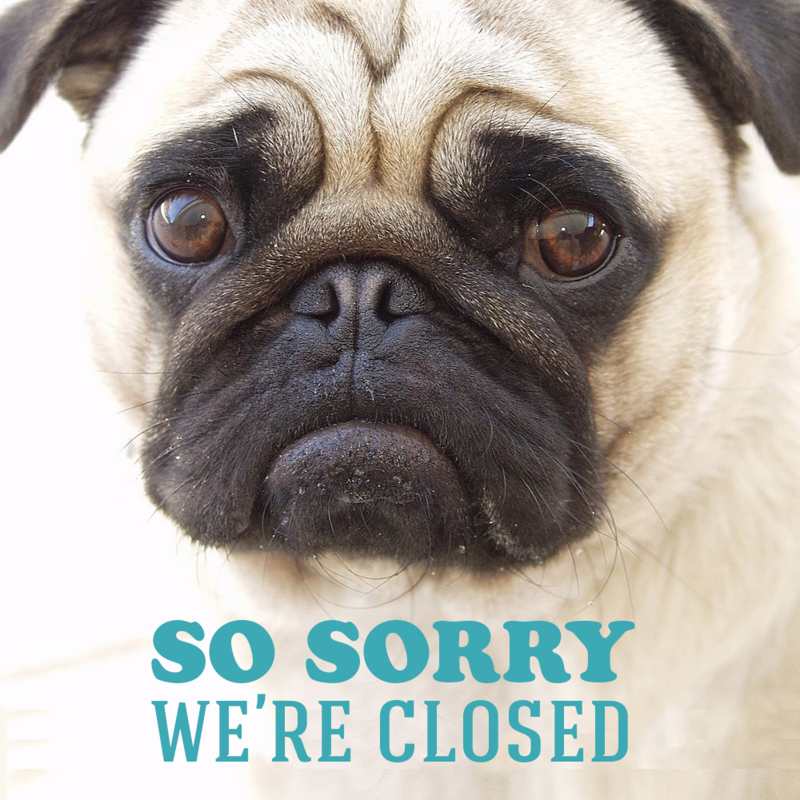 St Kilda Veterinary Clinic will be CLOSED on Saturday 6th October 2018 and will re-open on Sunday the 7th from 10 am. To celebrate we are offering FREE dental health checks and $50 off ALL dental procedures performed in the month of August! To make an appointment, give us a call! 2. Click "Register" and enter in your information. 3. Select St Kilda Veterinary Clinic in the "Vet Practice" field. Feliscratch, made by the creators of Feliway, is designed to redirect cat scratching onto your desired location away from your furniture! To order, contact reports@stkildavet.com.au or give us a call! At the St Kilda Veterinary Clinic, we pride ourselves on the quality of service we deliver to our clients for a fair and reasonable price. In line with this, we have made some changes to our consultation and vaccination structure and charges. Effective March 1st, 2018 all consultations and vaccinations will be charged out separately. This will ensure each patient and client is allocated a suitable amount of time for their general health checks, which will allow us to better manage our schedule and reduce wait times. If you would like an extended consultation (15-30 minutes) with one of our vets, please notify our nursing staff when booking an appointment and a suitable time slot will be allocated to you. For new puppy and kitten owners, we will be offering extended consultations with your vaccines to help clarify and deliver all the important information you need to know. For further information, please email reports@stkildavet.com.au or give us a call! Do you sometimes lose track of what parasite preventatives you should be giving to your pet and when? Have you ever forgotten to give your pet their regular parasite prevention on time? Do you wish there was a more affordable and cost effective way to pay for your pet's parasite prevention? If you answered "yes" to any of these questions then the Parasite Prevention Program is the solution. This service allows you to pay for your pet's parasite control monthly, spreading out the yearly expense into more manageable installments. Payments are made by direct debit from your nominated bank account or credit card with no lock in contract, meaning you can cancel anytime without penalty! Your pet's treatment will be sent directly to your door. There is even a discount for multi-pet households! For more information, or to sign up for the PPP service, click on the image below or give us a call! What is happening in September 2017? Spring is here! 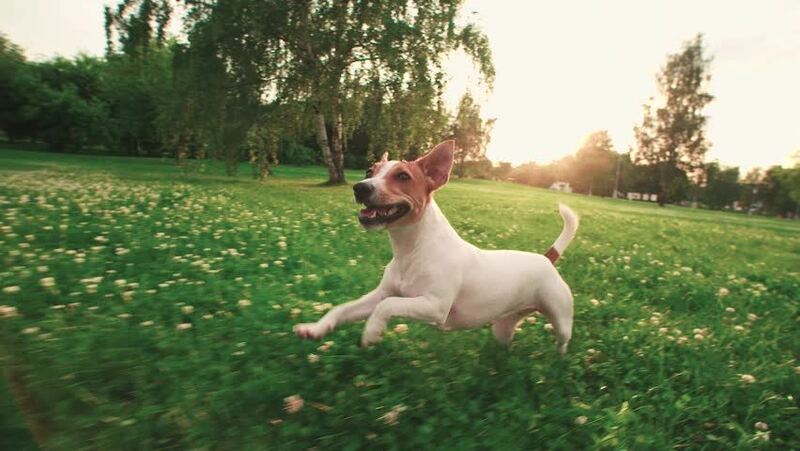 Finally we can enjoy more sunshine, more warmth and getting out and about more with our furry family members. As the seasons change we tend to see an increase in reactions to outdoor allergens- things like grasses, pollens and insects can wreck havoc on our pet's skin with some breeds more susceptible than others to uncomfortable reactions. We offer extended dermatology consultations to allow the opportunity to discuss the many ways these reactions can be minimised and how to help manage your pet's comfort should an accute reaction occur. 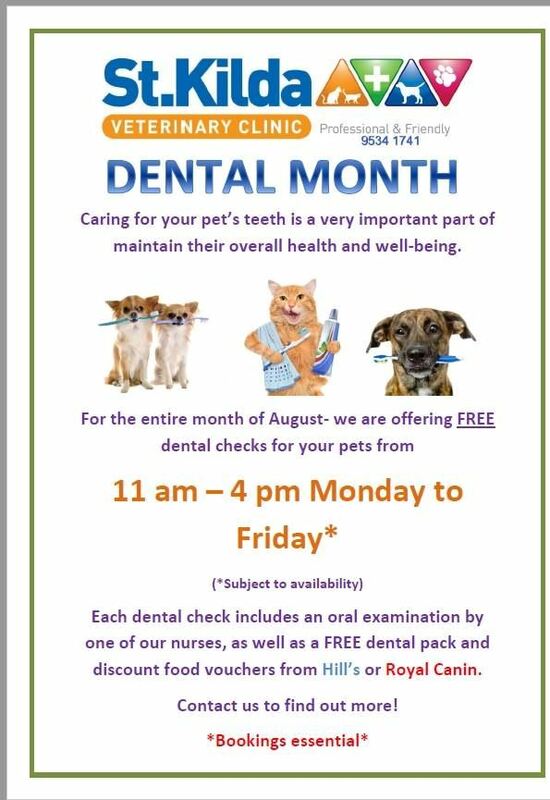 As always, Dental month during August was a huge success and so we have decided to extend the opportunity for free dental health checks across the month of September. These dental health checks are performed by our knowledgable nurses who are available by appointment between 11 am - 4 pm, Monday- Friday. Bookings are essential. During the Spring/Summer period with longer days and warmer nights, we see an increase in injuries caused by dog bites and dog attacks. With higher volumes of pets frequenting one of the many wonderful dog parks around the area there is an increased possibility of things getting out of hand. If your dog is bitten by another dog, it is important to recognise that the entire injury sustained is not always visible. A small bite wound might be all that you can see from the outside, but underneath that wound could be serious trauma and deep puncturing of the muscles. Imagine an iceberg- visible from the surface with even more going on below! There is also mental trauma and stress to consider as well as significant and painful bruising that may not come on until the next day. It is therefore important that you make an appointment for a full physical examination with a veterinarian, should this unfortunate event occur with your dog. We always strongly advocate for cats owners to strictly follow a cat curfew but this is even more important as the weather warms up! This can help prevent cat fights, injury and death of native wildlife and can help reduce the risk of cats being hit by cars. Cats who have been involved in cat fights will often hide signs of injury, with some owners not even aware their cat has been in a fight until days later. Cat's mouths are full of bacteria that are transfered into bite wounds and when these are left untreated, painful abscesses often form. Loss of appetite, anti-social behaviour, aggression and lethargy are all signs your cat could be nursing a nasty bite wound. If you notice any out of ordinary behaviour in your cat, please contact the clinic for advice. It is also a perfect time of year to ensure your cat's vaccinations are up to date, including FIV- Feline Immunodeficiency Virus- a highly infections virus transmitted by blood and fortunately, something we can vaccinate our cats against! For more information, or to book an appointment, give us a call! To celebrate, we are offering FREE dental health checks with out nursing staff for the entire month of August! All pets will receive a dental goodie bag plus discount dental food vouchers from Hills and Royal Canin! Bookings are essential. Want to win a Fuzzyard pet bed valued at $135*? 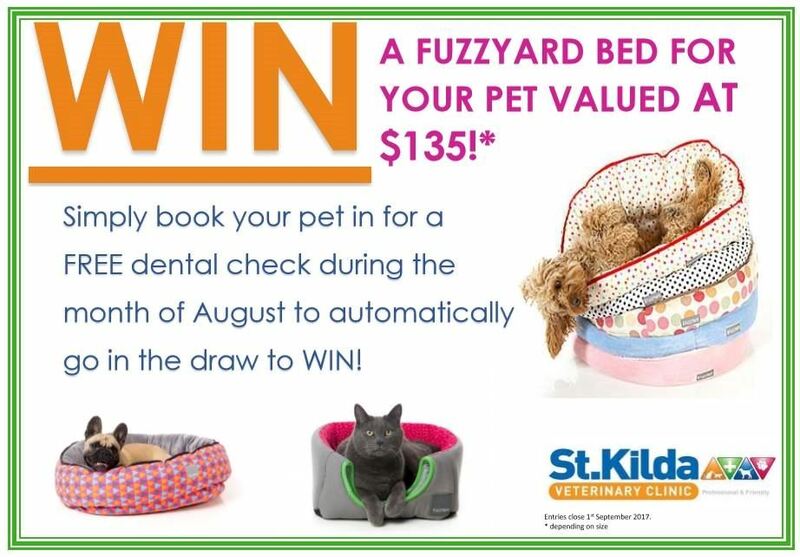 As part of August's Pet Dental Month, participants in our dental health checks will automatically go in the draw to win a wonderfully, plushy Fuzzyard bed! Fuzzyard goods are of exceptional quality and durability, purrfect for your cat or dog! Give us a call to book your pet in for a dental health check to go in the draw! *dependant on size of bed. At the St Kilda Veterinary Clinic, you will be fully supported with sound advice first and foremost. We know that helping our clients starts with providing a good understanding of health care issues and treatment options. With good advice and professional recommendations, you will be well equipped to make the best ongoing health care decisions for your pet. We are open 7 days a week and most public holidays. Consultations by appointment are preferred.